In Volume One, you'll see the history of the Hold Out and the background of The Invisible Hand. You'll see the legendary Kepplinger, an original Jack Miller Hold Out and other models. Furthermore, you'll find a detailed description of The Invisible Hand, setting, basic moves and advanced techniques and subtleties. 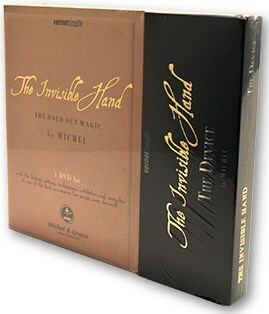 Finally you'll watch and learn one of the most beautiful effects you can do with the Invisible Hand: "The Silk Story". An Expansion Kit is available including additional holdouts and pulls!